KIR2DL4 (CD158d) is an unusual member of the killer cell Ig-like receptor family expressed in all NK cells and some T cells. KIR2DL4 activates the cytotoxicity of NK cells, despite the presence of an immunoreceptor tyrosine-based inhibition motif (ITIM) in its cytoplasmic tail. The role of this ITIM on the activating function of KIR2DL4, and whether it can provide inhibitory signals, is not known. Mutated forms of KIR2DL4 were engineered that lacked either the tyrosine in the ITIM or an arginine-tyrosine motif in the transmembrane region that is required for the activation signal. The activity of the mutated KIR2DL4 molecules was tested in a redirected lysis assay. The ITIM was not necessary for activation of lysis by KIR2DL4. The activation signal of KIR2DL4 was sensitive to inhibition by another ITIM-containing receptor. The activation-deficient mutant of KIR2DL4 inhibited the signal delivered by the activating receptor CD16. In pull-down experiments with GST fusion proteins, the tyrosine-phosphorylated cytoplasmic tail of KIR2DL4 bound the Src homology 2-containing phosphatases 1 and 2, as did the tail of the inhibitory receptor KIR2DL1. Therefore, KIR2DL4 has inhibitory potential in addition to its activating function. Natural killer cells are a fundamental component of the immune system, providing a link between innate and adaptive immunity. NK cells respond quickly and efficiently to viral, bacterial, and parasite infections by producing cytokines and by engaging a variety of receptors that recognize ligands on infected cells (1, 2). In healthy organisms, the cytotoxic activity of NK cells is regulated by a balance of positive and negative signals emanating from activating and inhibitory receptors, respectively. Specific signaling pathways leading to the activation or the inhibition of NK cells remain to be fully depicted (3). Several of the NK cell-activating receptors signal by association with immunoreceptor tyrosine-based activation motif (ITAM)2-containing partner chains (4). For instance, CD16 associates with the ζ-chain, NKp46 associates with the FcR γ-chain, while NKp44 and KIR2DS pair with DAP12. The noncovalent association of the ITAM-containing chains is controlled by a basic amino acid in the transmembrane region of the receptor that is compensated by an acidic amino acid at a similar position in the adaptor protein. Thus, the presence of a charged residue in the transmembrane region of an immunoreceptor indicates a potential for an activating function. Other NK cell-activating receptors, such as 2B4 (CD244) and CD2, carry signaling motifs in their own cytoplasmic tail (4). To override potentially harmful activation signals delivered by ITAM-containing molecules, NK cell activation is suppressed by inhibitory signals transduced by immunoreceptor tyrosine-based inhibition motif (ITIM)-containing receptors (5). In human NK cells, killer cell Ig-like receptors (KIR) and the lectin-like CD94/NKG2A receptor are mainly responsible for such inhibition. Some members of the KIR family carry two consecutive ITIM in their cytoplasmic tail and bind to classical HLA class I molecules. The ITIM is defined by the consensus sequence I/V/LxYxxL/V (6). Following tyrosine phosphorylation, the tandem ITIM recruits and activates tyrosine phosphatases that dephosphorylate components of the activation pathway. Src homology 2-containing phosphatase (SHP)-1 is thought to be the major phosphatase recruited in vivo by KIR, but the related phosphatase SHP-2 also binds phosphorylated ITIM in vitro and in vivo (7, 8, 9, 10). Although the precise molecular target(s) of SHP-1 still remains to be determined, ITAM-induced positive signals as well as signals from the activating receptor 2B4 are sensitive to ITIM-mediated inhibition (3). In contrast, the signaling pathway induced by the NKG2D/DAP10 receptor complex is not as sensitive to ITIM-mediated inhibition as that induced by ITAM-containing receptors (11, 12, 13, 14). Among KIR family members, KIR2DL4, which was assigned the new CD designation CD158d (15), displays unusual characteristics. First, KIR2DL4 carries a single ITIM (the tyrosine of the second ITIM is substituted by a cysteine residue). Second, in addition to the presence of an inhibitory motif, KIR2DL4 contains a charged residue in its transmembrane region, suggesting the possibility of an activating function for this receptor (16). These two properties may explain earlier observations on the function of KIR2DL4. Indeed, both inhibitory (17) and activating (18) functions have been described for KIR2DL4. Third, the mRNA of KIR2DL4 is present in every NK cell, in contrast to all other KIR that are expressed in overlapping subsets of NK cells (19, 20). Fourth, the two Ig-like extracellular domains of KIR2DL4 and of KIR2DL5 have the unusual D0-D2 configuration, in contrast to the usual D1-D2 and D0-D1-D2 organization of Ig domains in other KIR2D and KIR3D receptors, respectively. Finally, KIR2DL4 binds to cells expressing HLA-G (20, 21), a nonclassical HLA class I molecule expressed by trophoblast cells that invade the maternal decidua (22), by activated monocytes (23, 24), by thymic epithelial cells (25), and by certain tumor cells (26). In the present study, mutated KIR2DL4 receptors lacking either the charged residue in the transmembrane region or lacking the cytoplasmic ITIM were tested for their ability to activate or to inhibit NK cells. We report that KIR2DL4 lacking the ITIM is still activating NK cell cytotoxicity and that KIR2DL4 lacking the charged residue in the transmembrane region can deliver inhibitory signals. Human NK populations were purified as described (27). Briefly, NK cells were isolated from human PBL using the magnetic activated cell sorter NK cell isolation kit (Miltenyi Biotec, Auburn, CA). Human NK cells were maintained in Iscove’s medium supplemented with 10% human serum (BioWhittaker, Walkersville, MD), l-glutamine, 10% purified IL-2 (Hemagen Dignostics, Columbia, MD), and 100 U/ml rIL-2. The human NK cell line YTS (gift from G. Cohen, Massachusetts General Hospital, Charlestown, MA) and the mastocytoma cell line P815 (American Type Culture Collection, Manassas, VA) were maintained in Iscove’s medium supplemented with 10% FCS and l-glutamine. The following Abs were used: anti-CD16 (3G8, mouse IgG1), MOPC-21 (control mouse IgG1), all from BD PharMingen (San Diego, CA); anti-hemagglutinin (HA) mouse ascites fluid (16B12, IgG1; Covance, Richmond, CA); control mouse ascites fluid (NS-1, IgG1; Sigma-Aldrich, St. Louis, MO); anti-2B4 (C1.7.1, mouse IgG1), anti-KIR2DL1 (CD158a) (EB6, mouse IgG1), anti-KIR2DL3 (CD158b2) (GL183, mouse IgG1), all from Beckman Coulter (Miami, FL); anti-Src homology 2-containing inositol 5′-phosphatase (SHIP) (rabbit polyclonal IgG), anti-SHP-1 (rabbit IgG), anti-insulin receptor substrate-1 (IRS-1; rabbit IgG), biotin-conjugated anti-phosphotyrosine (4G10, mouse IgG2b), all from Upstate Biotechnology (Lake Placid, NY); and anti-SHP-2 (79, mouse IgG1; Transduction Laboratories, Lexington, KY). KIR2DL4 carrying an HA epitope tag at the N terminus (HA-2DL4) and an arginine-tyrosine to glycine-threonine (RY-GT) mutant of HA-2DL4 have been described (18). The unique tyrosine of the cytoplasmic tail of HA-KIR2DL4 was mutated to a phenylalanine residue using the oligonucleotide 5′-GGAGGTGACATTCGCACAGTTGG-3′ and its complement with the QuickChange site-directed mutagenesis kit (Stratagene, La Jolla, CA). The mutation was confirmed by sequencing, and the mutant HA-KIR2DL4 Y-F was cloned into the plasmid pSC65 and used to generate recombinant vaccinia viruses (Vac), as previously described (28). Recombinant vaccinia viruses encoding KIR2DL1 and KIR2DL3 Y312F have been described (28, 29). Purified viruses were used to infect human NK cells at 20 PFU/cell, and cell surface expression of recombinant proteins was monitored by FACS analysis. Infected or uninfected human NK cells were preincubated for 15 min at room temperature with Abs, and tested for their ability to kill 51Cr-prelabeled P815 cells (2500 cells/well) in a 3-h 51Cr release assay, as described (27). All points were conducted in triplicate, and every experiment was repeated at least three times. A series of GST fusion proteins with the cytoplasmic tails of different KIR were produced. Templates corresponding to the cloned cDNA of KIR2DS4 (CD158i), KIR2DL1 (CD158a), KIR2DL3 (CD158b2), KIR2DL4, KIR3DL1 (CD158e1), and KIR3DL2 (CD158k) were used for PCR amplification. The primers used to amplify the cytoplasmic tails of these individual KIRs are the following: common antisense primer, 5′-GCATCTCGAGGCCTTCAGATTCCAGCTGCTGG-3′; sense primers to amplify, 2DS4, 5′-GCATGGATCCCATCGCTGGTGCTCCGACAA-3′; 2DL1, 5′-GCATGGATCCCATCGCTGGTGCTCCAACAAA-3′; 2DL3, 5′-GCATGGATCCCATCGCTGGTGCTGCAACAAA-3′; 2DL4, 5′-GCATGGATCCCATCGCTGGTGCTCCAAAAAA-3′; 3DL1, 5′-GCATGGATCCCATCTCTGGTGCTCCAACAAA-3′; 3DL2, 5′-GCATGGATCCTATCGCTGGTGCTCCAACAAA-3′. PCR amplification was performed as follows: 28 cycles at 94°C for 25 s, 60°C for 45 s, and 72°C for 45 s. PCR products were digested with XhoI and BamHI and cloned in the pGEX-4T-1 vector (Pharmacia Biotech, Piscataway, NJ). GST fusion proteins were purified as described (30). Nonphosphorylated GST fusion proteins were produced in BL21(DE3) bacteria (Stratagene, La Jolla, CA), whereas tyrosine-phosphorylated GST fusion proteins were prepared from transformed TKB1 bacteria (Stratagene). The TKB1 strain of Escherichia coli can be induced with indole-acrylic acid to express a protein tyrosine kinase, which phosphorylates on tyrosine fusion proteins expressed in the same cell. Phosphorylation of the GST fusion proteins was confirmed by Western blot with 4G10 mAb (Upstate Biotechnology). No tyrosine phosphorylation of GST fusion proteins isolated from BL21(DE3) bacteria was detected. A total of 90 × 106 IL-2-activated human NK cells was radiolabeled with [35S]methionine (0.1 mCi/5 × 106 cells/1 ml; Amersham, Arlington Heights, IL) for 7 h. The cells were then lysed in lysis buffer (150 mM NaCl, 50 mM Tris, pH 7.4, 2 mM EGTA, 1% Triton X-100, 1 mM sodium orthovanadate), and, following preclearing with purified GST, the total cellular protein lysate was aliquoted and incubated with each described GST fusion protein (5 nmol/10 × 106 cells) in a final volume of 1 ml. After a 2-h incubation at 4°C, 50 μl glutathione-Sepharose (Pharmacia Biotech, Piscataway, NJ) was added for 45 min. Bound proteins were washed three times with lysis buffer, eluted with reduced glutathione (Pharmacia Biotech), resolved on SDS-polyacrylamide gels, fixed in a 10% acetic acid/50% methanol solution, and revealed by autoradiography. To deplete the total lysate of SHP-1, total cellular proteins were subjected to three consecutive immunoprecipitations with 20 μg anti-SHP-1 (or anti-IRS-1 as control). After each round, protein A-Sepharose (Pharmacia Biotech) was used to remove Ab-coated SHP-1. Efficient depletion of SHP-1 was confirmed by immunoprecipitation of the phosphatase from SHP-1- or IRS-1-depleted total proteins. 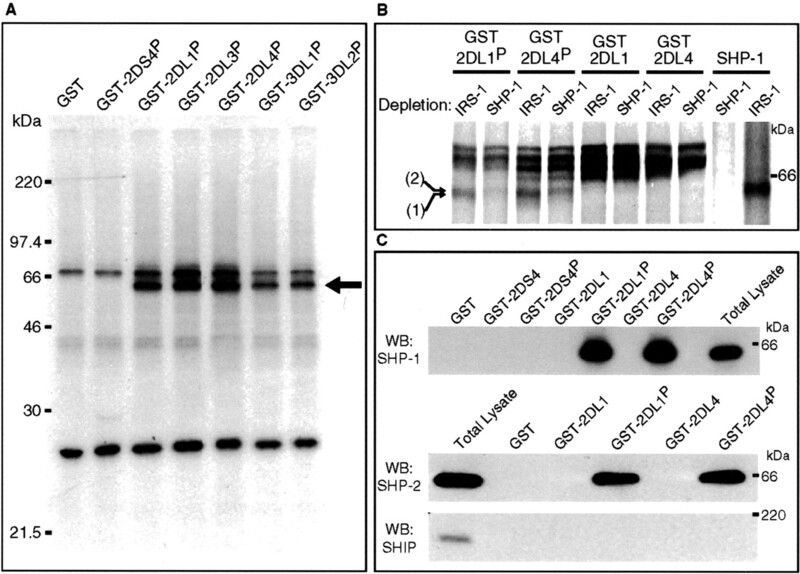 Binding of SHP-1, SHP-2, and SHIP to GST-KIR fusion proteins was measured by Western blot from total lysate of unlabeled YTS cells. Western blot was performed as described (29) with specific primary Ab and goat anti-rabbit IgG peroxidase (Amersham) or goat anti-mouse IgG peroxidase (Santa Cruz Biotechnology, Santa Cruz, CA) as the secondary Ab and Super Signal as the substrate (Pierce, Rockford, IL). Using an anti-KIR2DL4-specific mAb and P815 as target cells in a redirected Ab-dependent cellular cytotoxicity (rADCC) assay, we have recently reported that KIR2DL4 is an activating receptor in NK cells (18). Wild-type HA-tagged KIR2DL4 (to distinguish mutated from endogenous receptors) and a mutation of the arginine-tyrosine motif to glycine-threonine (RY-GT) in the transmembrane region of HA-KIR2DL4 expressed by recombinant vaccinia viruses (Fig. 1⇓) showed the requirement of the arginine-tyrosine motif to induce activating signals of KIR2DL4 (18). The charged arginine residue is thought to mediate interaction of KIR2DL4 with a partner chain that would be responsible for the activating signal. Using the same technical approach, we show in this study that NK cells expressing HA-2DL4 wild type (Fig. 2⇓A) kill P815 targets at the same level whether triggered with an anti-HA mAb or through engagement of the activating receptor 2B4 (CD244) (Fig. 2⇓Bb). Anti-HA mAb did not enhance lysis of P815 by uninfected NK cells, compared with control IgG, whereas a strong lysis of P815 was obtained in response to anti-CD16 mAb (Fig. 2⇓Ba). Coengagement of HA-2DL4 wild type with 2B4 led to an additive effect and induced a level of lysis of P815 equivalent to that obtained by triggering the activating receptor CD16 (Fig. 2⇓Bb). Schematic representation of the recombinant vaccinia viruses used in this study. On the left are listed the wild-type KIR2DL1, mutated KIR2DL3, and wild-type or mutated HA-tagged KIR2DL4 receptors that were expressed in vaccinia viruses. The ITIM motifs contained in the cytoplasmic tail of each KIR and the mutated transmembrane and cytoplasmic residues are indicated using the one-letter standard code for amino acid nomenclature. The KIR2DL4 ITIM is not required for activation signals. A, HA surface expression of uninfected, HA-tagged wild-type KIR2DL4 or HA-tagged KIR2DL4 Y-F Vac-infected human NK cells (20 PFU/cell). B, a, b, and c, Uninfected or Vac-infected human NK cells were preincubated for 15 min with 1 μg/ml IgG1 isotype control MOPC (□), 1 μg/ml anti-CD16 (○), 1 μg/ml anti-2B4 (✙), a 1/200 dilution of an anti-HA ascites (⋄), or with the same concentration of anti-CD16 + anti-HA (•) or anti-2B4 + anti-HA (✚). Bd, Uninfected (open symbols) or Vac-HA-2DL4 Y-F-infected (filled symbols) human NK cells were incubated with a serial dilution of anti-HA ascites (squares) or control ascites (circles), at a 3:1 E:T ratio. NK cells were then tested for their ability to kill 51Cr-labeled FcR+ P815 target cells in a 3-h rADCC assay. To test the role of the single cytoplasmic ITIM in KIR2DL4-activating signals, a tyrosine to phenylalanine substitution (Y-F) was introduced in the ITIM sequence, and the HA-2DL4 Y-F mutant (Fig. 1⇑) was expressed on NK cells using vaccinia viruses. 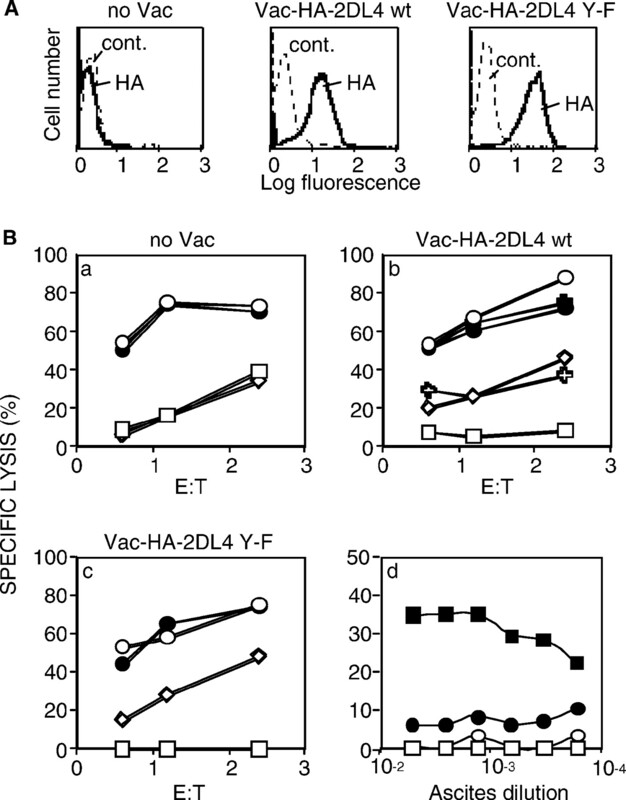 Infection of NK cells with Vac-HA-2DL4 Y-F resulted in uniform expression of HA-2DL4 Y-F at the cell surface, equivalent to that of HA-2DL4 wild type, as detected by FACS analysis (Fig. 2⇑A). In a rADCC assay, NK cells infected with Vac-HA-2DL4 Y-F lysed P815 cells in the presence of anti-HA mAb to the same extent as NK cells infected with Vac-HA-2DL4 wild type (Fig. 2⇑Bc). Lysis obtained through ligation of CD16 alone was not affected by coligation of HA-2DL4 Y-F (Fig. 2⇑Bc). As with HA-2DL4 wild type, coligation of 2B4 and HA-2DL4 Y-F resulted in an additive effect on P815 lysis (data not shown). Specific lysis induced by HA-2DL4 Y-F was observed over a wide range of anti-HA mAb concentration (Fig. 2⇑Bd). (All other experiments with HA-2DL4 in this study were conducted at a 1/200 dilution of anti-HA mAb.) These results show that KIR2DL4 delivers activating signals that do not require the unique ITIM present in the cytoplasmic tail. HA-2DL4 wild type delivers activating signals to NK cells, despite the presence of an ITIM in its cytoplamic tail. We therefore asked whether KIR2DL4 was resistant to inhibition by ITIM-containing receptors. 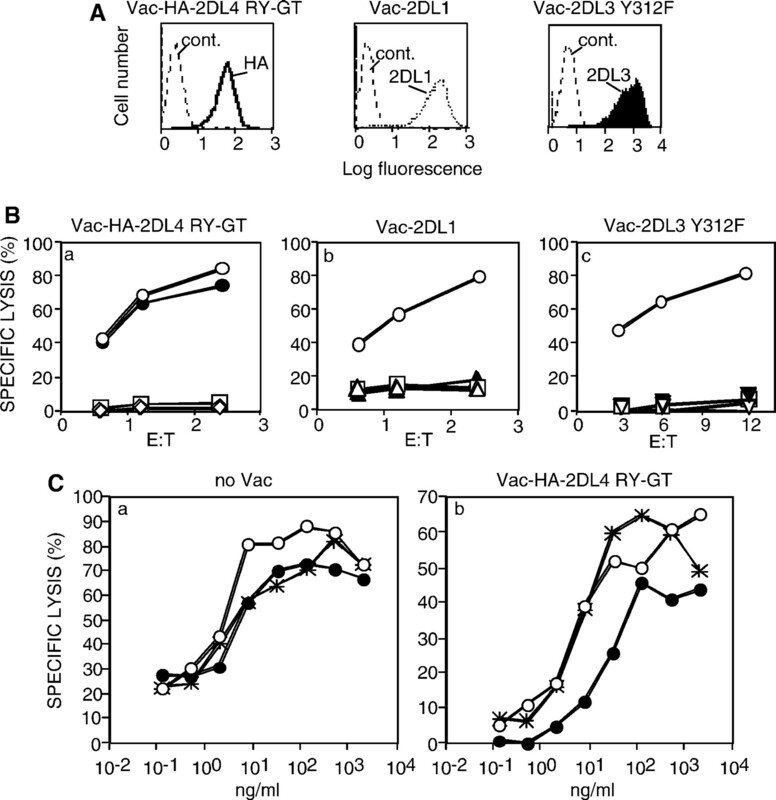 NK cells were coinfected with Vac-HA-2DL4 Y-F and Vac-2DL1. 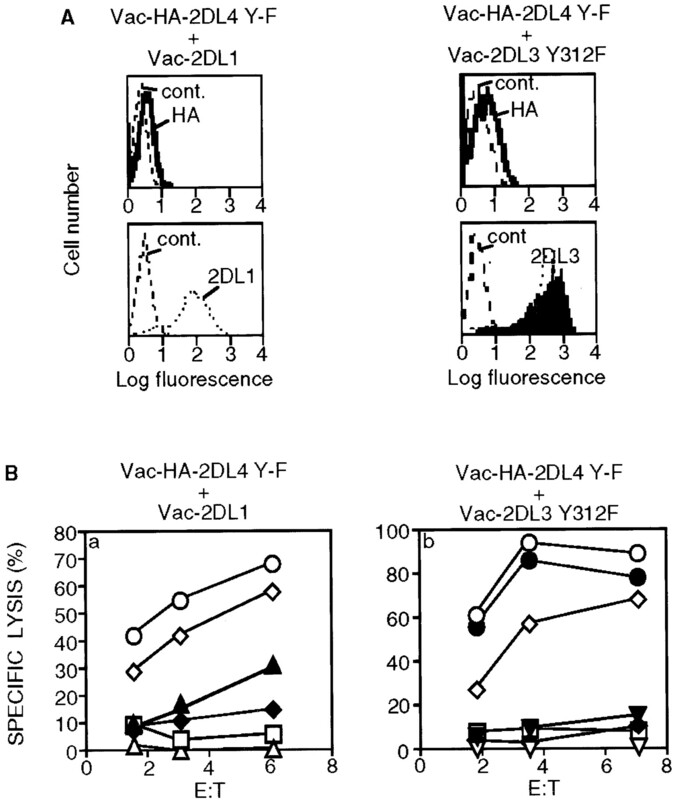 The cell surface level of HA-2DL4 Y-F was much lower after coinfection with Vac-2DL1 (Fig. 3⇓A) than after infection with Vac-HA-2DL4 Y-F alone (Fig. 2⇑A). Despite low cell surface levels, activation through HA-2DL4 Y-F was still strong in the P815-redirected lysis assay, reaching a level comparable with that with anti-CD16 (Fig. 3⇓Ba). Cocross-linking of KIR2DL1, which was expressed at a high level, blocked activation through HA-2DL4 Y-F as efficiently as that through CD16 (Fig. 3⇓Ba). To test whether activation through HA-2DL4 Y-F was sensitive to coengagement of a receptor carrying a single ITIM (as in KIR2DL4), NK cells were coinfected with Vac-HA-2DL4 Y-F and a vaccinia virus encoding Vac-2DL3 Y312F (an inhibitory KIR lacking the tyrosine in the second ITIM (Fig. 1⇑)). Coligation of KIR2DL3 Y312F completely inhibited the P815 cell lysis induced by HA-2DL4 Y-F and that induced by CD16 (Fig. 3⇓Bb). These results show that activation through KIR2DL4 is sensitive to inhibition induced by a conventional KIR2DL and by a KIR containing only the membrane-proximal ITIM. KIR2DL4 activation is sensitive to KIR-mediated inhibition. A, Surface expression of the indicated recombinant vaccinia in infected human NK cells. B, Vac-infected human NK cells were preincubated for 15 min with 1 μg/ml IgG1 isotype control MOPC (□), 30 ng/ml anti-CD16 (○), 1 μg/ml anti-KIR2DL1 (▵), 1 μg/ml anti-KIR2DL3 (▿), a 1/200 dilution of an anti-HA ascites (⋄) or with the same concentration of anti-CD16 + anti-HA (•), anti-CD16 + anti-KIR2DL1 (▴), anti-CD16 + anti-KIR2DL3 (▾), anti-HA + anti-KIR (⧫, KIR2DL1 or KIR2DL3 in a or b, respectively). Lysis of P815 was detected as indicated in Fig. 2⇑. The sensitivity of KIR2DL4 activation signals to inhibition by a receptor carrying only the membrane-proximal ITIM suggested that the membrane-proximal ITIM of KIR2DL4 itself may not be functional. We asked whether the ITIM of KIR2DL4 could provide inhibitory function by using the activation-deficient HA-2DL4 RY-GT mutant expressed with a recombinant vaccinia virus (Fig. 4⇓A). As we reported, triggering HA-2DL4 RY-GT with an anti-HA mAb did not induce lysis of P815 cells (18) (Fig. 4⇓Ba). Coligation of HA-2DL4 RY-GT with CD16 did not inhibit the CD16-induced lysis of P815 cells (Fig. 4⇓Ba). In this experiment, CD16 was cross-linked with a saturating concentration of the anti-CD16 mAb 3G8 (1 μg/ml). KIR2DL1, containing two ITIMs, blocked the CD16 activation signal completely (Fig. 4⇓, A and Bb), as did KIR2DL3 Y312F (Fig. 4⇓, A and Bc). As KIR2DL4 and KIR2DL3 Y312F have the same conserved ITIM sequence (Fig. 1⇑), the lack of inhibition by HA-2DL4 RY-GT is not simply due to the lack of a second ITIM. The inhibitory effect of HA-2DL4 RY-GT was then tested under conditions of limiting signals through CD16. In control experiments with uninfected cells, anti-HA ascites or control ascites did not affect the anti-CD16 dose-response profile (Fig. 4⇓Ca). In contrast, 5–10 times more anti-CD16 Ab was required when HA-2DL4 RY-GT was cocross-linked, to match the level of P815 lysis obtained in the presence of control ascites (Fig. 4⇓Cb). The partial inhibition triggered by KIR2DL4 RY-GT may be due to lower vaccinia virus-mediated receptor expression and/or to a weaker affinity of the HA-specific Ab than that of EB6 for KIR2DL1 or GL183 for KIR2DL3. Alternatively, the cytoplasmic tail of KIR2DL4 might be intrinsically less inhibitory than that of other KIR2DL receptors. Altogether, these results indicate that the cytoplasmic tail of KIR2DL4 has inhibitory potential. The cytoplasmic tail of KIR2DL4 has inhibitory function. A, Recombinant receptors surface expression of the indicated Vac-infected human NK cells. B, Vac-infected human NK cells were preincubated for 15 min with 1 μg/ml IgG1 isotype control MOPC (□), 1 μg/ml anti-CD16 (○), 1 μg/ml anti-KIR2DL1 (▵), 1 μg/ml anti-KIR2DL3 (▿), a 1/200 dilution of anti-HA ascites (⋄) or with the same concentration of anti-CD16 + anti-HA (•), anti-CD16 + anti-KIR2DL1 (▴), or anti-CD16 + anti-KIR2DL3 (▾). C, Uninfected or Vac-HA-2DL4 RY-GT-infected human NK cells were preincubated for 15 min with a serial dilution of anti-CD16 (○), with anti-CD16 + a 1/200 dilution of an anti-HA ascites (•), or with anti-CD16 + a 1/200 dilution of a control ascites (✶), at a 1:1 E:T ratio. Lysis of P815 was detected as indicated in Fig. 2⇑. The cytoplasmic tails of several KIRs were produced as GST fusion proteins to test for their association with cytoplasmic proteins. The cytoplasmic tails of KIR2DL1, KIR2DL3, KIR3DL1 (which contain two ITIMs), of KIR3DL2 (which has a nonstandard second ITIM and 11 unique C-terminal amino acids), and of KIR2DS4 (which carries a short ITIM-less cytoplasmic tail) were compared with the single ITIM-containing cytoplasmic tail of KIR2DL4 (Fig. 5⇓). As KIR2DL4 carries a unique C-terminal sequence of 37 aa not found in other KIRs, we were interested in the possibility of specific protein associations with the tail of KIR2DL4. Either tyrosine-phosphorylated or nonphosphorylated GST fusion proteins were produced in E. coli. Phosphorylation of each GST-KIR fusion protein was confirmed by Western blot using a phosphotyrosine-specific mAb (data not shown). IL-2-activated human NK cells were labeled with [35S]methionine, and proteins from total lysates were pulled down with GST-KIR fusion proteins attached to glutathione-Sepharose. Associated proteins were analyzed by SDS-PAGE and autoradiography (Fig. 6⇓A). No specific protein association was detected with the unphosphorylated cytoplasmic tails of any of the KIRs (data not shown). In contrast, tyrosine-phosphorylated tails of each KIR, except for KIR2DS4, bound protein(s) with an apparent molecular mass of 62–64 kDa. This protein(s) did not bind to GST alone (Fig. 6⇓A). Therefore, one predominant protein species associated with all the phosphorylated ITIM-containing tails, and no unique association was detected with the phosphorylated GST-2DL4 fusion protein. Schematic representation of the GST fusion proteins used in this study. 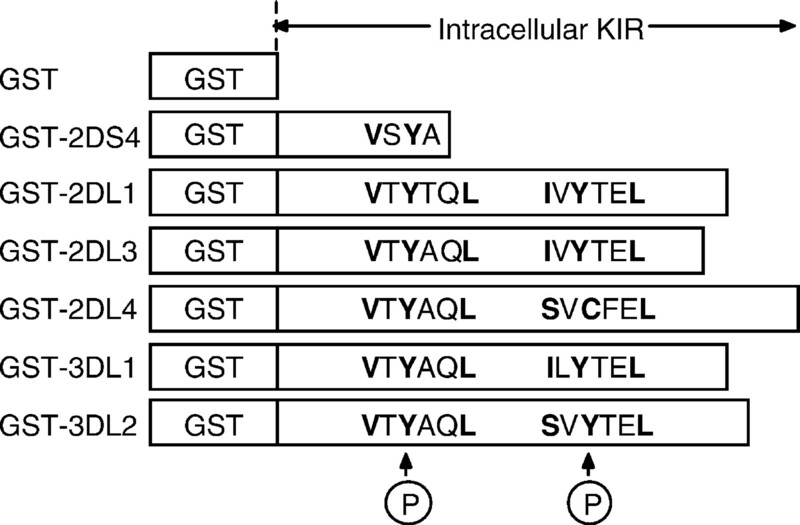 The cytoplasmic tails of the indicated KIR were fused to GST, and the corresponding fusion proteins were produced either phosphorylated on tyrosine or not, as described in Materials and Methods. The ITIM motifs contained in the cytoplasmic tail of each KIR are indicated using the one-letter standard code for amino acid nomenclature. Phosphorylated KIR2DL4 binds SHP-1 and SHP-2. A, Purified IL-2-activated human NK cells were labeled with [35S]methionine and lysed, and the total lysate was aliquoted and pulled down with the indicated phosphorylated GST-fusion proteins. The samples were analyzed by electrophoresis on a 10–20% SDS-PAGE, followed by autoradiography. The arrow on the right indicates the band further analyzed in B. B, The total lysate of 35S-labeled human NK cells was either depleted of SHP-1 with a specific Ab or treated with an isotype control Ab specific for IRS-1. The lysates were then either pulled down with the indicated GST-fusion proteins or immunoprecipitated with an anti-SHP-1 Ab. The samples were analyzed on a 6% SDS-PAGE. The two arrows on the left indicate the bands detected before (1) or after (2) SHP-1 depletion. C, The total lysate of the NK cell line YTS was equally divided, and each sample was pulled down with the indicated GST-fusion proteins and Western blots were performed for SHP-1, SHP-2, or SHIP, as indicated. P indicates that the fusion proteins were produced phosphorylated on tyrosine. The protein(s) bound to the phosphorylated ITIM-containing GST-KIR corresponds in size to the tyrosine phosphatases SHP-1 and SHP-2. To determine whether SHP-1 was indeed a binding protein, we first depleted the [35S]methionine-labeled proteins in the NK cell lysate with a mAb specific for SHP-1. An isotype-matched mAb specific for IRS-1 was used as control. Depletion of SHP-1, but not of IRS-1, led to a strong reduction of the main 62-kDa protein bound to the phosphorylated cytoplasmic tail of KIR2DL1 and KIR2DL4 (Fig. 6⇑B, arrow 1). Another protein of ∼64 kDa remained after SHP-1 depletion (Fig. 6⇑B, arrow 2). This protein corresponds in size to the phosphatase SHP-2. Western blotting was performed to confirm association of SHP-1 and to test whether SHP-2 was also bound to the phosphorylated cytoplasmic tails of KIR2DL1 and KIR2DL4. SHP-1 and SHP-2 were specifically pulled down by glutathione-Sepharose coated with tyrosine-phosphorylated GST-2DL1 and GST-2DL4 (Fig. 6⇑C). Western blotting analysis with Abs specific for the inositol phosphatase SHIP did not reveal association of this protein after pull down with phosphorylated GST-2DL1 or GST-2DL4 glutathione-Sepharose (Fig. 6⇑C). SHIP binds a tyrosine-phosphorylated sequence motif distinct from, but similar to the SHP-1-binding motif (31). Our results show that, when phosphorylated, the ITIM of KIR2DL4 can bind the phosphatase SHP-1, as do inhibitory KIR with two ITIMs, confirming the inhibitory potential of KIR2DL4. The nonclassical class I molecule HLA-G may be one of the natural ligands of KIR2DL4, as soluble KIR2DL4 binds to cells expressing HLA-G (20, 21). HLA-G is expressed primarily on trophoblast cells of the fetus that invade maternal decidua during early pregnancy. Signaling through KIR2DL4 might be of particular relevance in that context because NK cells represent >80% of decidual lymphocytes and contact invading fetal trophoblast cells during pregnancy (32, 33). Ponte et al. (17) have reported expression of KIR2DL4 (also called p49) on NK cells present at the maternal-fetal interface, but not on peripheral NK cells. The protection from lysis by decidual NK cells of HLA-G-expressing target cells was reversed by an anti-p49 antiserum, suggesting that KIR2DL4 was inhibitory. HLA-G is also expressed by certain malignant cells and is thought to inhibit lysis of those tumor cells by NK cells (26). Melanoma cells expressing HLA-G have been shown to escape lysis by NK cells (34), possibly through a KIR2DL4-mediated inhibition pathway (35). In contrast, KIR2DL4 is also a potent inducer of IFN-γ secretion in both resting and activated peripheral NK cells (18). These different results underscore the importance of determining the outcome of signaling by KIR2DL4. We report in the present study that KIR2DL4 has the potential for both activating and inhibitory functions. Target cell lysis by activated NK cells induced by KIR2DL4 in a redirected lysis assay does not require an intact cytoplasmic ITIM, but an intact transmembrane region that includes an arginine residue (Ref. 18 , and this study). Target cell lysis induced by KIR2DL4 with a mutated ITIM in a rADCC assay was as efficient as that induced by wild-type KIR2DL4. This result suggests that the ITIM may serve other functions, such as inhibition of other signals. Indeed, as shown in this study, the single ITIM of KIR2DL4 can bind tyrosine phosphatases and deliver negative signals. The nature of the signal delivered by KIR2DL4 may depend on the type of cell expressing KIR2DL4. For instance, it is interesting that KIR2DL4 engagement on resting NK cells results in IFN-γ production, but not cytotoxicity, whereas IL-2-activated NK cells respond to KIR2DL4 by increasing both IFN-γ secretion and cytotoxicity (18). Whether natural mutations that disrupt the arginine in the transmembrane region of KIR2DL4 exist is not known. This type of mutation has been described for the activating receptor KIR2DS2 (36). As a result, the mutant KIR2DS2, lacking the lysine residue in the transmembrane region, failed to associate with DAP12 and to deliver activation signals. Coligation of a nonactivating mutant of KIR2DL4 (the HA-tagged RY-GT mutant) with CD16 resulted in a dose-response shift in target cell lysis induced by CD16, in a rADCC assay. Greater concentrations of anti-CD16 mAb were required when HA-2DL4 RY-GT was cocross-linked to achieve the same level of target cell lysis than that induced by engaging CD16 alone. However, this inhibition was not as strong as that obtained by cocross-linking wild-type KIR2DL1. The presence of a single ITIM in KIR2DL4, as opposed to the two ITIMs found in inhibitory KIR2DL receptors, does not explain the weaker inhibition because a mutated KIR2DL3 carrying only the first ITIM was fully inhibitory in the same assay. It is possible that cross-linking HA-2DL4 RY-GT through the N-terminal HA epitope tag does not generate the full inhibitory signal. Alternatively, the context of the unique KIR2DL4 cytoplasmic tail may dampen the inhibitory function of the ITIM. As the inhibitory function of the KIR2DL4 cytoplasmic tail was tested in the context of a mutated receptor that was unable to activate, it is not known whether this inhibitory signal can be delivered by a wild-type KIR2DL4. The normal function of the ITIM in KIR2DL4 is not known. Although the level of killing induced by wild-type KIR2DL4 and the KIR2DL4 Y-F mutant is similar, it is possible that the ITIM serves to down-modulate activation signals transmitted by KIR2DL4 itself. Such modulation may contribute to the unique ability of KIR2DL4 to induce IFN-γ secretion without inducing cytotoxic activity in resting NK cells (18). Alternatively, recruitment of SHP-1 and SHP-2 by the KIR2DL4 ITIM may serve to terminate the activation signal, in a manner similar to the negative autoregulation of the erythropoietin receptor by SHP-1 recruitment (37). It is also possible that the ITIM of KIR2DL4 does not recruit SHP in intact cells because of structural constraints imposed by the putative partner chain or by the cytoplasmic tail itself. The activation signal transmitted by wild-type KIR2DL4 leading to IFN-γ secretion by activated NK cells is sensitive to inhibition by ITIM-containing receptors, such as CD94/NKG2A (18). In this study, coligation of the activating KIR2DL4 Y-F with either a wild-type KIR2DL1 or a mutated KIR2DL3 carrying only the first ITIM resulted in complete inhibition of the KIR2DL4 signal, indicating that KIR2DL4 is potentially sensitive to the ITIM sequence present in its own cytoplasmic tail. KIR2DL4 contains a charged amino acid (arginine) in its transmembrane domain, reminiscent of the lysine residue found in the transmembrane domain of numerous NK cell-activating receptors, such as NKp30, NKp46, KIR2DS, and NKG2C, that pair with ITAM-containing signaling partner chains (4). It is possible that the arginine mediates a noncovalent interaction with an as yet unidentified partner chain that transmits the positive signal. Consistent with this hypothesis, disruption of the arginine-tyrosine motif in the transmembrane domain abolishes the ability of KIR2DL4 to induce target cell lysis by IL-2-activated NK cells (Fig. 4⇑Ba) (18). Once this putative signaling subunit is identified, it will be possible to test its effect on and sensitivity to the ITIM of KIR2DL4. KIR2DL4 might have a costimulatory function in activation of natural cytotoxicity, as described for other receptors such as 2B4, CD2, and NKp80 (2). The mouse target cell line P815 used in our rADCC experiments expresses ligands for the human-activating receptor NKp46, and LFA-1 (38). The enhanced lysis of P815 induced by cross-linking KIR2DL4 is similar to that obtained by cross-linking 2B4 and may result from costimulation of signals from NKp46 and LFA-1. Interestingly, coengagement of KIR2DL4 and 2B4 resulted in additive levels of target cell lysis, suggesting that those receptors induce different signaling pathways. Distinct signaling by these two receptors was observed in resting NK cells: cross-linking KIR2DL4 induced IFN-γ secretion, but not cytotoxicity, whereas the opposite response was obtained after cross-linking 2B4 (18). The cytoplasmic tail of KIR2DL4 resembles that of inhibitory KIRs, except for a unique C-terminal extension and for the presence of a cysteine in place of the tyrosine in the second ITIM. The first ITIM is within a stretch of amino acids that is conserved among inhibitory KIRs in primate species (39, 40, 41). Inhibitory KIRs with a mutation in the second ITIM (tyrosine to either phenylalanine or serine) retain inhibitory function in NK cells (29, 42 , and this study) and in a transfected rat basophil cell line (10). Using chimeric receptors expressed in RBL cells, Bruhns et al. (10) reported that a cytoplasmic tail of KIR lacking the tyrosine of the second ITIM recruits tyrosine phosphatase SHP-2 preferentially over SHP-1. In this study, cytoplasmic tails of several KIRs were produced as GST fusion proteins, either phosphorylated or not on tyrosine. When used in pull-down experiments with lysates of NK cells, the phosphorylated tail of KIR2DL4 bound SHP-1 and SHP-2, as did the tail of KIR2DL1. Therefore, both SHP-1 and SHP-2 may be recruited in vivo by the single intact membrane-proximal ITIM of KIR2DL4. The C-terminal extension of the KIR2DL4 cytoplasmic tail is conserved among higher primates and may serve some unique function (39, 40, 41), even though we did not detect other cellular proteins besides SHP-1 and SHP-2 that bound to the cytoplasmic tail of KIR2DL4. In conclusion, the activating and inhibitory properties of KIR2DL4 endow this receptor with the potential to regulate different types of NK cell responses. Using a different approach, Yusa et al. (43) also concluded that the cytoplasmic tail of KIR2DL4 has inhibitory function. We thank G. Cohen for the gift of YTS cells; M. Sandusky for nucleotide sequencing; M. Weston for vaccinia virus purification; D. F. Barber, Y. Bryceson, S. Rajagopalan, and C. Watzl for help in NK cell isolation; and B. Riteau and S. Rajagopalan for comments on the manuscript. ↵2 Abbreviations used in this paper: ITAM, immunoreceptor tyrosine-based activation motif; HA, hemagglutinin; IRS-1, insulin receptor substrate-1; ITIM, immunoreceptor tyrosine-based inhibition motif; KIR, killer cell Ig-like receptor; rADCC, redirected Ab-dependent cellular cytotoxicity; SHIP, Src homology 2-containing inositol 5′-phosphatase; SHP, Src homology 2-containing phosphatase; Vac, vaccinia virus.